Probably around 9 BC, date of the dedication of the Ara Pacis. 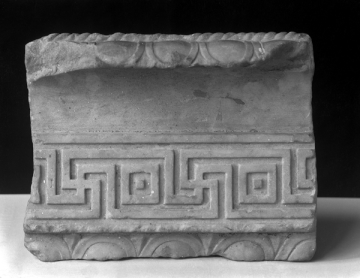 A fragment of the upper outside moulding of a non-architectural, functional object such as a cistern or fountain enclosure; the decoration consists of a cable moulding, lip with gadrooning, cavetto, fret, fillet, and further gadrooning at the bottom. A somewhat similar (?) fragment is pictured in the Conservatori Gardens, built into an ivy-covered wall1 and is found also in the top mouldings of the Trajanic or early Hadrianic reliefs from the Rostra area of the Forum, now preserved in the Curia2. The fret demonstrates the closest parallel in time, style, and pattern in the motive as found below the upper outside relief panels of the Ara Pacis3. 1 H.S. Jones (ed. ), A Catalogue of the Ancient Sculptures Preserved in the Municipal Collections of Rome: the Sculptures of the Palazzo dei Conservatori, Oxford, 1926, II, p. 244, no. 73, pl. 95. 2 P. Romanelli, The Roman Forum, trans. C. Pennock, Roma, 1950, p. 83, fig. 35. 3 G. Moretti, L'Ara Pacis Augustae, trans. V. Priestley, Roma, 1939, pls. II-IV, etc.